In 2005, Muttley had approached a certain TV channel with his idea to pimp a new ride, the Leyland Olympian bus he’d just acquired, and to take it on a grand European tour, to Italy, and that years Isle of MTV Festival. Sadly, the European trip fell foul of the events of 7/7, and the bus, now replete with its hot tub and PA, as well as no small number of fluorescent decals, came to operate only as a stag, hen and prom party travel option, all the while taking up time and costing money. Mr & Mrs Bus, though, had other ideas. Having brought the Crazy Baldhead on board as a co-owner, plans were put in place to run the bus as a mobile members club, taking the mountain to the Mohammeds that found themselves in the country’s festival fields, and providing a VIP experience to those that deserved it. The top having already been removed, and the decals peeled away, the upstairs was resprayed, and the loungers given a… ‘bubble’ treatment. 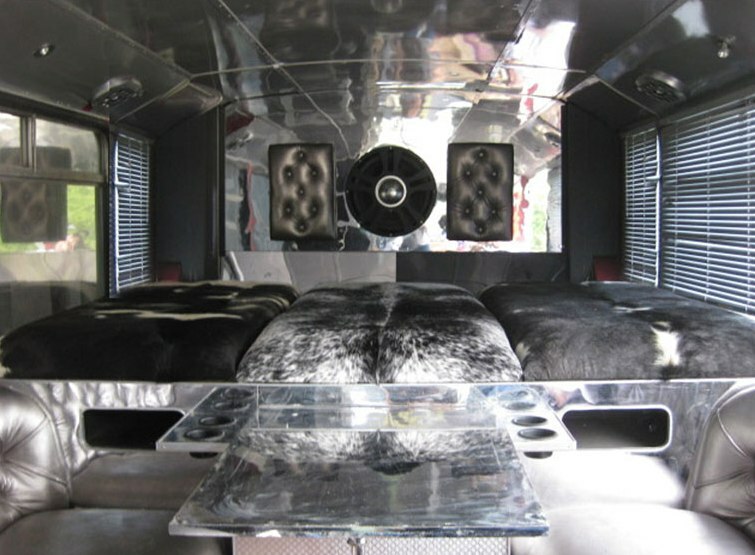 Downstairs, the 8ft bed was covered in genuine cow hide, silver Chesterfields were made by our good friend Robbie, the plasma TVs and PA were rewired, and the windows removed to reveal a steel bar and wet-weather DJ booth. Boo, Jez, Squidge and The Tutu spent sunny days painting the picket fence, and the newly appointed Master Bus worked on making sure we were mobile. 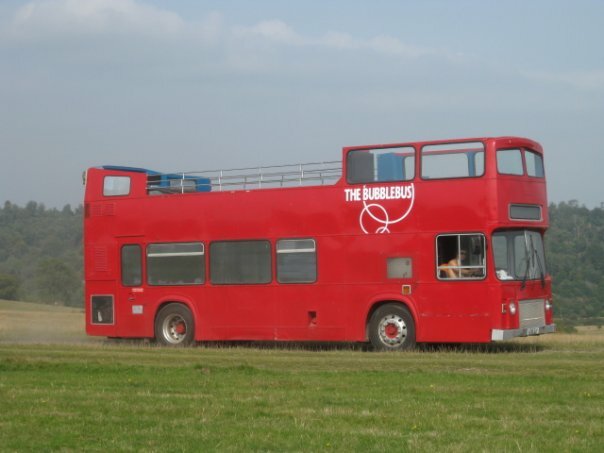 And on 29th June 2009, the world’s first fully mobile VIP bar, the Bubblebus, was finally born. We've the Bubblebar, with on tap bubbles (of course! ), cocktails, and more, coming complete with a 100 m sq private Garden, a roster of the finest DJs, late opening, witty banter and endless hospitality. - a Promo Vehicle, able to promote your brand, anywhere, anytime. Contact us at thebubblebus@gmail.com for more information. Copyright © 2012, Cajato Ltd. All rights reserved.. Picture Window theme. Powered by Blogger.